This collection includes three novellas set in the world of the Iron Fey plus the Guide to the Iron Fey with exclusive information about Julie Kagawa’s unforgettable world of Faery. Never make a promise to a faery. They always come to collect. Now Meghan Chase must fulfill her promise to Prince Ash of the Winter Court and embark upon a dangerous journey into the heart of enemy territory—while being pursued by a relentless new foe and guarding her own foolish heart. What can turn enemies into reluctant allies? A call from the Exile Queen, Leanansidhe, ties legendary prankster Puck to his archenemy, Prince Ash, on a journey that may end in betrayal and will set them both on an irreversible path. Before she ever knew what she might become, Iron Queen Meghan Chase was warned by the oracle that her firstborn child would bring nothing but grief. And even as Meghan and Ash celebrate their long-awaited union, the prophecy stirs. I like having the Iron Fey novellas in print, they look so pretty on my shelf! I re-read Winter’s Passage and Summer’s Crossing, and found I liked them both, and Iron’s Prophesy was really interesting. Winter’s Passage – Reading this took me back to a whiny Meghan and brought back all my memories of why I didn’t like her very much initially. She’s easily distracted by Ash and is constantly hyper-aware of where he is, what he is doing, and reacts stupidly to his touch. I liked that Ash relaxed a lot more around her though. The Hunter’s chase is well imagined and I thought he was terrifying, but he gave up too easily on his quest. Having said that, the story excellently highlights how strongly the fey feel about their honour and keeping their promises. Summer’s Crossing – Told from Puck’s point of view, this novella has to be my favourite of the three. It follows Ash and Puck as they sneak into the Summer Court and steal something from the Summer Queen. Oberon’s interference and proposal to Puck throws a wrench into the works, and although I never really doubted that Puck would make the right decision, I liked how Julie Kagawa examines his motivations and makes the decision-making process more real. In hindsight I would have thought Ash would have protested more the adventure, but I was glad it all worked out in the end and Ash and Puck started their journey to repairing their relationship. Iron’s Prophesy – A short novella told after Ash and Meghan are married, giving us a glimpse of their lives as the rulers of the Iron Court. It’s a great set up for The Lost Prince, and I am looking forward to seeing how it ties in. All our favourite characters are back: Puck and Grimalkin help Ash and Meghan journey to see the Oracle about a prophesy, and I commend Meghan for making that really hard decision all alone. I think she’s come a long way since The Iron King! 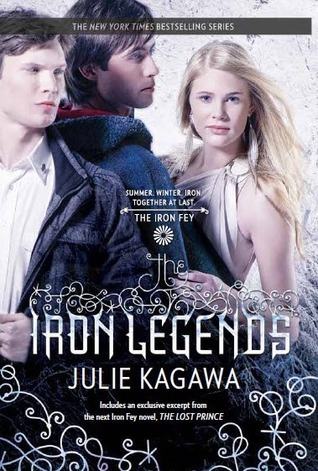 This collection of stories from Julie Kagawa is worth buying for fans of the Iron Fey series, and I think readers will definitely benefit from reading Iron’s Prophesy before they begin The Lost Prince.